More than a dozen working-class protesters have been shot and killed by police, Special Forces and pro-government militias across south and central Iraq over the past week, amid a widening popular upsurge against the US-backed government of Prime Minister Haider al-Abadi. The driving force of this movement is anger that seven years after the official withdrawal of the US military forces that invaded, occupied and devastated the country, conditions of life remain intolerable and the government has failed to deliver on its promises to use the country’s oil wealth to benefit the people, rather than multinational oil companies and a corrupt stratum of Iraqi collaborators with US imperialism. Since the killing of a demonstrator in Basra on July 8, six more people have been killed in the city, Iraq’s third largest and the center of its oil industry. Other deaths have been reported at the hands of security forces in the cities of Amara, Samawa and Muthanna, as well as mass shootings in Nasariya and Karbala. The casualty toll reported by international news services has reached 14 dead and 366 injured. Hundreds have been arrested as the government seeks to crush the mass protests before the movement becomes so widespread that it cannot be contained. 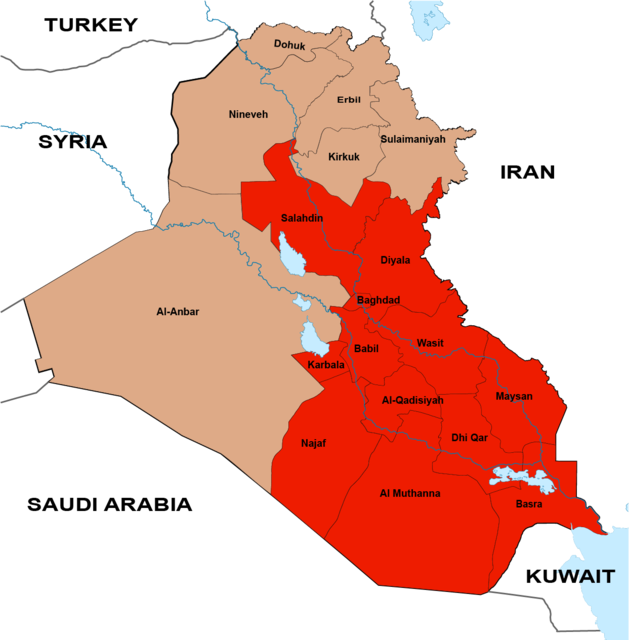 In the first week alone, protests localized to Basra and al-Muthanna provinces in the far south spread throughout the entire south, where the majority of Iraq’s people live, and into Baghdad, Diyala and Salahuddin provinces in the center of the country. The demonstrations began in Basra, whose oil industry produces the bulk of national wealth, but whose residents live under some of the poorest and most degrading conditions imaginable, with high levels of unemployment and poverty and a virtual absence of civilized public services such as electricity and clean running water. As the movement spread, crowds of protesters targeted some of the most critical transport facilities, forcing the shutdown of the Um Qasr port, Basra’s main outlet to the Persian Gulf, from which nearly all oil tankers depart carrying Iraqi oil, as well as the country’s second busiest airport, in Najaf, and the two main border crossings in the south, Safwan with Kuwait and Shalamcheh with Iran. Hundreds of protesters sought to block access to major oil-producing facilities, including the West Qurna-1 oilfield, operated by Exxon Mobil, the West Qurna-2 oilfield, managed by the Russian firm Lukoil, and Rumaila, the giant state-owned oilfield that is one of the world’s largest. On Monday, 200 protesters sought to block the main entrance to the Siba natural gas field in Basra. 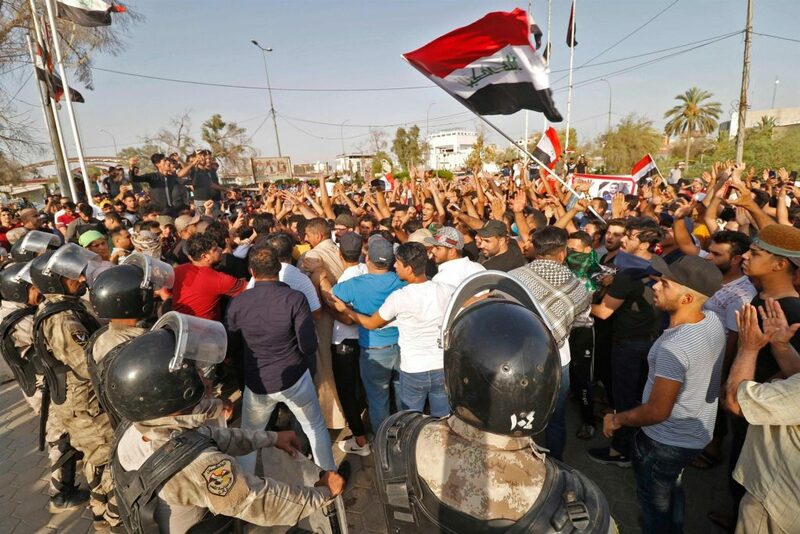 Demonstrations against unemployment, corruption, and the collapse of utilities and other public services spread through the southern provinces of Maysan, Karbala, Najaf, Babil, Wassit, al-Qadisiya and Dhi Qar, eventually reaching the capital Baghdad. By the weekend, there were protests in two provinces north of Baghdad, Diyala and Salahuddin, which were further devastated during the three years of war between Iraqi government forces, backed by the United States and its imperialist allies, and the Sunni fundamentalist group ISIS. The protests have swept the entire Shiite-populated region of the country. They represent a class movement by working-class Shiites against an administration based on the bourgeois Shiite parties, which have been unable to form a new government since the May elections because of conflicts with rival Sunni and Kurdish elites, as well as tensions within the Shiite ruling class itself. By this weekend, the political focus of the upheaval had become more pronounced, with demonstrators attacking the offices of the ruling Shiite parties and their militia organizations in Najaf. In al-Muthanna province, protesters stormed government buildings and party offices. One was killed and 15 wounded attacking the provincial council offices. Demonstrators also burned the headquarters of the two main Shiite bourgeois parties, Virtue and Dawa, and of the Badr Organization, the most powerful Shiite militia group, as well as the Badr al-Samawa TV station. At least 33 protesters were arrested Sunday and 65 more on Monday in al-Muthanna province alone. Prime Minister al-Abadi rushed back from Brussels, where he was attending a meeting on the sidelines of the NATO summit to discuss the ongoing struggle against ISIS. He flew directly to Basra to meet with local officials and tribal leaders, ordering a combination of repressive measures and palliatives. The government imposed a curfew in several southern provinces and shut down the Internet for most of the south for several days. Elite counterterrorism troops were sent in to confront protesters, erecting barbed-wire barricades around government offices and oil facilities. At the same time, al-Abadi established a six-minister committee headed by oil minister Jabbar Ali Husayn al-Luaibi to funnel money into the Basra region, promising allocations for improvements in the water system and the electricity distribution system. The population of the city appeared little impressed. A video posted on social media showed al-Abadi being rushed away by bodyguards as protesters attacked the hotel where he was staying in Basra. In a clear indication of the fear that the upheaval has struck in the Iraqi ruling elite, some of the most powerful figures in the Shiite political establishment issued statements on Friday expressing sympathy for the demonstrators. Moqtada al-Sadr, the one-time Shiite radical whose party won the biggest bloc of parliamentary seats in the May election, tweeted Friday that the protests were “a revolution of the starving.” Al-Sadr, whose Mahdi Army loyalists once fought against the US occupation, has long since made his peace with the American Embassy. He is expected to emerge as the power behind the throne in any new government in Baghdad. In an ominous forewarning of greater bloodshed to come, some Shiite media outlets linked to Iran denounced the protesters as “infiltrators,” echoing the Tehran regime’s condemnations of popular protests over economic conditions when they broke out at the beginning of this year in Iran. There may be some links between the Iranian protests and those now emerging in Iraq; only a week before the protests began in Basra, there were violent clashes between police and protesters in the cities of Abadan and Khorramshahr, less than two hours’ drive to the east across the Iraq-Iran border, and over the same issue—poor-quality water supplies. Four people were shot to death by Revolutionary Guard forces June 30 in Khorramshahr.